Officer Johnson and Officer Hodges from the Roanoke City Police Department spoke about workplace violence on August 23, 2017. Their focus was on how to respond to an active shooter or violent intruder in the workplace. There is no right thing to do in this situation—every situation is different, but the most important thing to remember is that having a plan in place at your company can make all the difference. 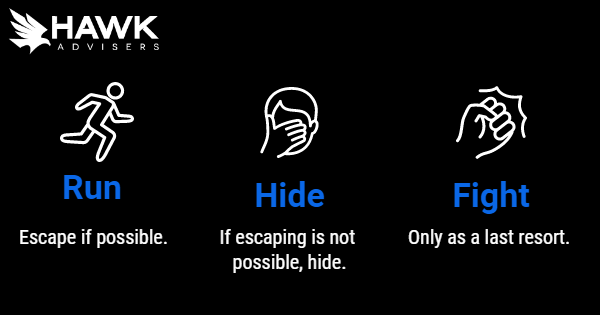 How can you protect yourself if you are faced with an active shooter situation? Evacuate to a safe location. If evacuation is not possible, get out of view. Provide protection for yourself – barricade a door if you can and find the closest object around you that could be used as a weapon. This is only as a last resort. Throw items and improvise weapon use. Yell and scream to divert shooter’s attention. Ambush tactics are always more effective in numbers. When you are able to call 911 make sure to provide your location. If you can, provide the number of shooters on the premises and a physical description of the shooters. If you are unable to speak at the time that you placed the call, just set the phone down and allow the dispatcher to listen to what is happening. On average, it takes an estimated time of three minutes for officers to respond to a 911 call. In those three minutes, do everything within your power to stay alive until help arrives.